On 26 October 2018 we reported that the advanced materials company, First Graphene Ltd (“FGR”) (ASX: FGR) released an update on the use of its PureGRAPH™ products in the mining services sector. FGR has now followed up with a confirmed purchase order for 2,000 kg of their PureGRAPH™ material to be delivered during 2019, for use in the Armour-GRAPH™ product range in a mining equipment application. The purchase order for 2,000kg of PureGRAPH™ range products from newGen for delivery during 2019, represents a significant development not only for FGR, but also for the broader graphene market. It demonstrates the initial market appetite for high quality bulk graphene products of the type in which FGR specialises. Up until now the graphene sector has been supplying mostly samples for evaluation. This order represents a step change in the business as it starts to scale up for larger size orders. Pleasingly, the premium price to be received pursuant to the order debunks the myth that graphene is expensive. The productivity benefits and material performance improvements experienced when PureGRAPHTM is added to materials more than compensate for the cost of the graphene, and it underpins the pricing strategy employed by First Graphene. As previously reported (see article below) FGR is working closely with newGen Group to provide performance enhancement to their existing products with the addition of PureGRAPH™ graphene products. newGen Group has recently introduced a branded Amour-GRAPH™ product range of wear liners for bucket wheel, pipe spools and conveyor heavy equipment applications. In a recent development, the Company was pleased to confirm further progress in its R&D collaboration with newGen Group. 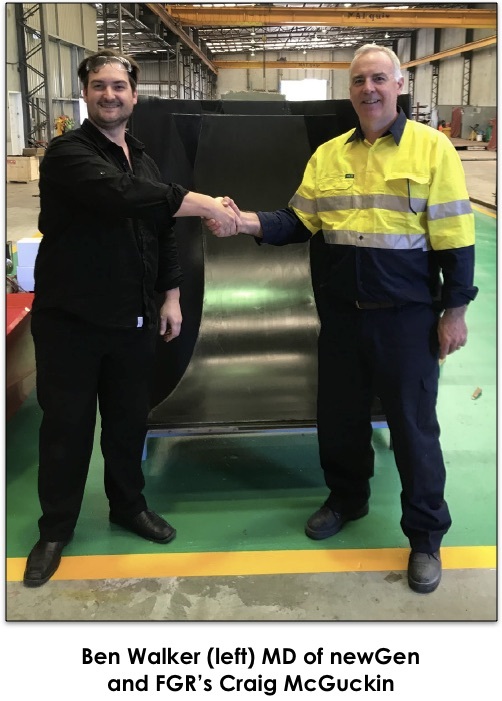 newGen is supplying a wear lining system for dryer chute applications to a large Australian cement producer in their Perth facility. It is a leading supplier of cement and lime to the Western Australia’s mining, agriculture and construction industries. Each 50m2 liner will contain 10 to 12kg of PureGRAPH™ and is a further significant step in the adoption of First Graphene products into large industrial applications. PureGRAPH™ has been demonstrated to provide up to 37% improved tensile strength and improve abrasion resistance by 100% to 500% in high performance polyurethanes. newGen has now issued a purchase order for 2,000kg (2 tonnes) of PureGRAPHTM to be drawn down as it wins tenders during 2019. There is one final regulatory approval required before the first sale is effected, being the registration of graphene by the National Industrial Chemicals Notification and Assessment Scheme (NICNAS) in Australia. Similarly, the Registration, Evaluation, Authorisation and Restriction of Chemicals (REACH) needs to be completed for sales in the European Union. These registration processes are currently underway and they are not expected to provide any meaningful delays. The National Industrial Chemicals Notification and Assessment Scheme (NICNAS) registration process is required for all chemicals used in industry in Australia. Within the European Union REACH registration is required if an organisation plans to sell greater than one tonne of a chemical within the EU or United Kingdom. First Graphene Ltd has already joined the consortium which is registering graphene as a new chemical. The consortium consists of three graphene organisations, one from China, one from Canada and one European producer. Managing Director, Craig McGuckin, stated: “We said that we were the world’s leading graphene company, and we are now proving it with this sales order – the start of many. We do not believe there is another company which could deliver both the volume and the consistent quality this order requires. We are now entering an exciting growth phase as industries all around the world are starting to look at ways in which they can use graphene to improve their products and lower their operating costs”. FGR is working closely with a number of companies to demonstrate performance enhancement of their products through the addition of its PureGRAPH™ graphene products. In this case, the wear-life of mining equipment can be extended with the inclusion of PureGRAPH™ graphene into protective polymer linings. The rapid progress made with these polymer linings was enabled by the high consistency of PureGRAPH™ products and the ease of dispersion into the polymer resin. The know-how being acquired is readily transferable to a vast range of other polymer products, in many industries. The suitability of the PureGRAPH™ is particularly pleasing as it confirms this is a commercially superior product. It is expected that, as manufacturing companies start to witness the improvements that graphene can offer, there will be an acceleration of demand for supplies of PureGRAPH™. First Graphene is well-positioned to satisfy the demand as it enters an exciting growth phase. PureGRAPH™ graphene has been successfully incorporated into a high volume application in the mining sector. 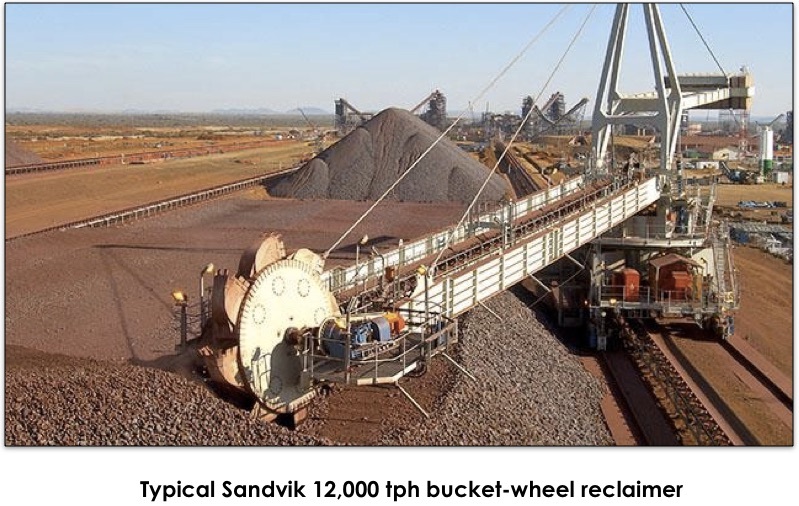 There are 12 buckets on the wheel for the machine these buckets are destined for, each with a capacity is 2.2 m3. The reclaimer has a nominal machine capacity is 12,000 tph and maximum capacity is 14,500 tph in bauxite. As announced in June 2018 FGR is working with newGen Group on equipment used in the mining industry to improve polyurethane liners to protect them from excessive abrasion and increase their useful life. Since then FGR and newGen have conducted various tests using PureGRAPH™ in polyurethane to determine the best suited PureGRAPH™ product and the optimum quantity to be added. These tests have demonstrated that the PureGRAPH™ product provides significantly increased flexural strength to the base polyurethane product. 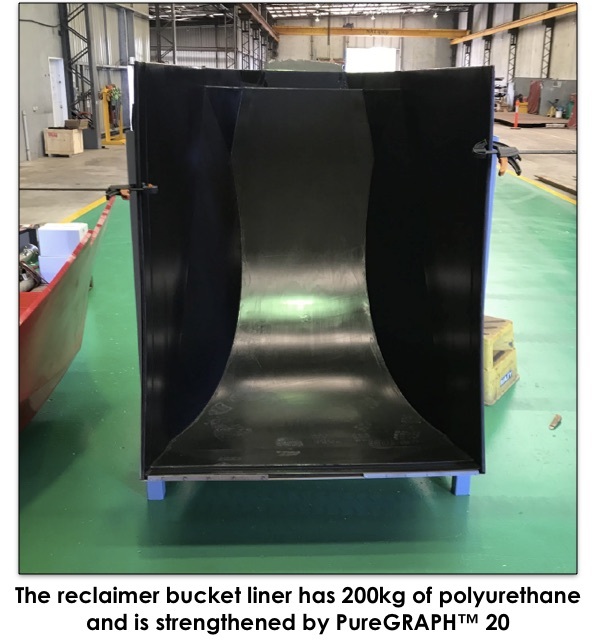 newGen have now cast a liner for a Sandvik reclaimer bucket using PureGRAPH™ 20 and are now working with FGR on the use of a PureGRAPH™ enhance polyurethane in other high volume mining applications in the iron ore industry where newGen are preferred supplier. The PureGRAPH™ range of products were released by FGR in September 2018, in conjunction with a detailed Product Information Sheet. PureGRAPH™ graphene powders are available with lateral platelet sizes of 20μm, 10μm and 5μm. The products are characterised by their low defect level and high aspect ratio. Graphene, the well-publicised and now famous two-dimensional carbon allotrope, is as versatile a material as any discovered on Earth. Its amazing properties as the lightest and strongest material, compared with its ability to conduct heat and electricity better than anything else, means it can be integrated into a huge number of applications. Initially this will mean graphene is used to help improve the performance and efficiency of current materials and substances, but in the future, it will also be developed in conjunction with other two-dimensional (2D) crystals to create some even more amazing compounds to suit an even wider range of applications. One area of research which is being very highly studied is energy storage. Currently, scientists are working on enhancing the capabilities of lithium ion batteries (by incorporating graphene as an anode) to offer much higher storage capacities with much better longevity and charge rate. Also, graphene is being studied and developed to be used in the manufacture of supercapacitors which can be charged very quickly, yet also be able to store a large amount of electricity.